I had my first mooncake this week – a dough covered, red bean paste filled sweet, purchased and exchanged during the mid-autumn moon festival which is being celebrated this weekend in San Francisco. I have been prodded in the past to try something with red bean paste and have enjoyed other desserts made with the filling. So, it seemed like a perfect time to try it out. 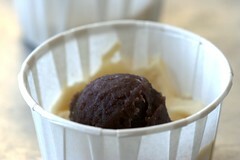 Red bean paste is sweet and earthy with a distinct “beanie” flavor, a good match for cupcakes. I researched bean paste recipes and they all basically involved soaking, boiling, pureeing, and cooking the paste with sugar and oil. I cut back significantly on the amount of sugar and oil and liked the end result although it was less sweet and less thick than the commercial products I have tasted. I stuck to a basic cupcake base, filled each with paste, baked them, topped them with a yummy date-pineapple cream cheese frosting and dipped each in lightly salted sesame seeds. The end result was delicious. Sweet, but a touch salty and the bean and sesame flavors shown through. I also wanted to point out the addition of a new page on the right, baking basics & troubleshooting. Folks new to baking should definitely give it a read. And if any of you experienced folks have anything to add, please do! 6. After the paste has cooled, scoop out 3/4″ balls. I used a small ice cream scooper. Cover loosely with plastic wrap so they won’t dry out. 5. Fill each cupcake paper about 1/4 full. Smooth with the back of a spoon. Press in a bean paste ball. Top with more batter until about 3/4 full. Smooth with the back of a spoon. Note: Baking these is a little tricky as they end up a bit full. I pre-heated the oven to 375 then turned it down to 350 once I put the cupcakes in. This worked out well; I lost only one to overflow… and it wasn’t quite lost… I did eat it after all. 3. Sift powdered sugar into the bowl, add vanilla, then beat until combined. NOTE: You can add more or less sugar to get to the consistency and sweetness you like. 2. Dip into lightly salted sesame seeds. Hmm, fascinating. I’m really intrigued by this partly because I’ve never had sweet red bean paste. Second the seasame seeds also seem like it comes from right field. I think I’ll make them someday just to satisfy my curiosity. I love the idea of filling them before baking. I’d love to see a picture of one cut in half (or with a bite taken out of it) to see what the filling looks like after baking. why not used the sweet red bean paste from the can? too sweet? this idea is intriguing, i’m used to eating red bean paste with something either steamed or fried and chewy. I would never call anything you make ‘weird’! This site is about innovation and being creative and new. Keep thinking outside of the cake-box! Though I’ve never seen anything exactly like this, similar desserts are easily found here in Japan. Most popular are little sweet “pancakes” with a scoop of bean paste (called AN in Japanese), but the varieties abound. With ice cream and with jelly are also very popular. These are so cute. I can’t wait to try my hands on it. =) Thxs cheryl, for sharing such a lovely inspiration. These look way better than traditional mooncakes with the egg center – I’ll take these over them any day! I just love your ideas…who says there is nothing new under the sun…the adzuki beans in my cupboard are calling to me now…Do you have any pumpkin-y cupcakes you do? Very cute! I love how the bean paste stays centered. Long time reader, first time poster. 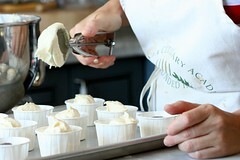 I love your blog, the creative use of ingredients, and the photography. Have you thought of using the fine disk of a food mill to puree things like the beans for this recipe? Very interesting recipe – the combination of Date-Pineapple cream cheese and the bean paste sounds very intriguing! 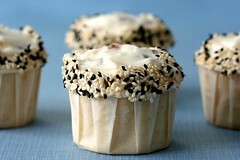 I like the finishing touch with the sesame seeds – lovely! After growing up in Japan, these cupcakes make me homesick!I used to take tea ceremony lessons – I can totally see mini versions of these guys being passed around! I always liked the chunky beanpaste (tsubuan) – you add some cooked beans back into the pureed paste – adds another element of texture that it awesome! Fantastic! We always have sweetened red bean in my house, so definetely will give these a shot as I think my family would absolutely love these cupcakes! could you substitute the canned red bean paste for this with similar results? i would love to make these, they do sound so yummy. altho i am a bit leary about the pineapple, i am willing to trust your tastes! 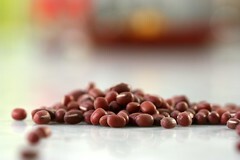 The flavour of green tea blends wonderfully with red beans. You might want to try green tea flavoured cupcakes with red bean paste filling? In Malaysia, we have green tea bread buns with red bean paste filling instead. DUDE, I used to wonder why no one made read bean cupcakes…either with red bean filling or some kind of red bean-based frosting. (pineapple is a great idea!). I guess there are already a lot of red bean based desserts out there, but everything can be CUPCAKE-IFIED! :) Your cupcakes look sooo beautiful and tasty. The sesame seeds are an awesome touch! I love how you come up with such original ideas for cupcakes. You are certainly pushing the boundaries in cupcake kingdom!! I’ve not tried any of your recipe but this one is screaming out to be tested. Very timely too as dates are abundant now in Malaysia, being the month of Ramadhan. Combination of pineapple and date did make me go “Huh?” Adzuki bean is also readily available. 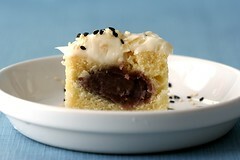 I love love love bean paste mooncakes, but never had the brilliant idea to make it into cupcakes. I can’t wait to try it! In a neighborhood Filipino bakery, they have bread filled with red beans and ube paste. These flavour combinations sound like a success to me, I love red bean. I recently found your blog recently and love it! Your recipes and photographs are inspiring! I love the flavor of mooncakes, but they are just “too much” for me — too dense, too eggy. This is a great middle-ground. Now, if only you would deliver! Very very spectacular. I love it, and will attempt it tres soon. I love red bean paste! And this is the most interesting mooncake I’ve ever seen. It’s the mooncake season and everyone is making traditional mooncakes at home. Your recipe is a refreshing change from the usual, lotus seed/ egg yolk/ snow skin version! wow! amazing! thats a great idea! My mouth has hit the floor…yur site is dangerously good!! I am drooling too! Amazing receipes, ideas, and PHOTOS!! Bravo!! i really really love your taste in cupcakes. i love not-too-sweet desserts AND i love interesting applications of flavors. even though i’m stuck in a tiny nyc kitchen i’m going to try these right after i try the caramel apple ones! Aran, I posted the photo at the end. Teresa, I did a pumpkin cupcake last year. Melinda, that’s a great suggestion. I lost my food mill two moves ago. 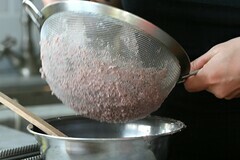 The hand blender worked very well, but a food mill is a great option. I have a potato ricer as well, and I bet that would work. And thanks for the kind words everyone. It’s just too much fun coming up with things. I was just bouncing ideas off of my husband during the morning commute. His birthday is next weekend, so I have to come up with something fantastic. Oh the pressure! I love your blog and your cupcakes are so unusual and creative. How do you eat the cupcake. I find these liners a little cumbersome. You gotta tear it, and lift the cupcake out & it just seems messy. How do you come up with so many amazingly unique recipes? You are so inpsiring, seriously! I tried out two of your recipes today. Tasted great! Although I made a few mistakes and ended up spending 6 hours in the kitchen. I made the samoa cupcakes and left the mixer on to wash somthing ended up washing other things forgeting the mixer was still on and over mixed the batter. For the Peanut butter chocolate cupcakes i couldnt find any cooking chocolate in 6 supermarkets ended up buyin Lindt Dark chocolate and the chocolate ganache was a little lumpy therefore i couldnt pipe it and really light in color :(. Next time i will make sure that i stock up on chocolate when its in stock because it seems to be a rare comodity here in oman! i’ve just discovered your website, and I like it very much! the pictures are beautiful and the recipes seems so good and very creative and original, i just want to test them all! what i like also are the “tutorials” pictures. I LOVE YOU! Bread pudding and cupcakes together?!?!? WOW! Can’t wait to try this! After living in Japan I found myself craving red bean paste in desserts, and these cupcakes are just perfect! I have a batch in right now, and I’m having trouble resisting them until they’re cooked properly! I just discovered your blog a couple of weeks ago and I absolutely love it–beautiful photos and great directions. Thank you so much for this recipe! My husband and I were in Korea last year and our favorite breakfast was a pastry filled with red bean paste. I made these cupcakes last weekend, with a few substitutions for my son, who is allergic to dairy products. They were delicious. My husband said they brought him right back to our favorite bakery in Seoul. this recipe looks awesome – the pictures help so much, and i can’t wait to try it! Made these tonight (with canned red bean paste — and halved the recipe). UNBELIEVABLE! you are really talented. Thanks!! Hi, I am an event orgnaizer interested in featuring your amazing cupcakes this coming Mooncake Festival at a major mooncake event in Singapore…pls contact me +65 9189 1777or email me soonest possible. Pls do revert…as I am eager to work with you on featuring your unqiue creations. I made these, red bean paste and all, with your green-tea cream cheese frosting…everyone raved over them. Thanks for a wonderful blog! Amazing, amazing pictures. Fantastic idea – looks absolutely scrumptious. It’s easy to tell how well the diverse flavors all just blend together. My mouth’s watering! I made these yesterday and they were delish! I can’t wait to try your other cupcakes esp. the asian-inspired ones. Everyone was raving and then craving for them. I just made these little cupcakes today for my Birthday tomorrow, and they are so Amazing! However, I had to use a mixture of red beans, and the adzuki bean, because no grocery store in Madison seems to sell the beans. They still turned out delicious! Thanks for this wonderful recipe! Could you please tell me how many minutes to bake this cupcake? I noticed you did not write this into your recipe. i tried your recipe and it was delicious!!! I got great responses from all my big and small tasters. fairly simple instructions. i might jus try your other recipes. Love reading your blog and recipes. 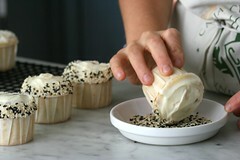 I am inspired by your wonderful recipes and innovative way of incorporating asian ingredients to your cupcakes. Mooncakes are difficult to make and this cupcake recipe seems like a wonderful blending of Western and Eastern tastebuds. I’m definitely going to try this one, thanks for sharing and teaching! hello! i’ve become a regular visitor to your creative, informative and beautiful website! i made the mooncake cupcakes yesterday following your recipe, and it was phenomenal! EVERYONE loved it and said it was one of the best cupcakes they’ve had. i made them with less sugar and reduced-fat butter because of diabetic concerns in our family, and they stilled turned out tasty and moist. i loved every part about this recipe. i wanted to say thank you for encouraging delectable, enjoyable and creative baking!! you’re awesome!! I definitly noticed your CCA apron. I am currently a student there. I love your blog.